Added a sunroom onto my house and bought this patio furniture set for it and I love it! Great quality and thick cushions. I have gotten a lot of compliments on it. Would recommend to family and friends. 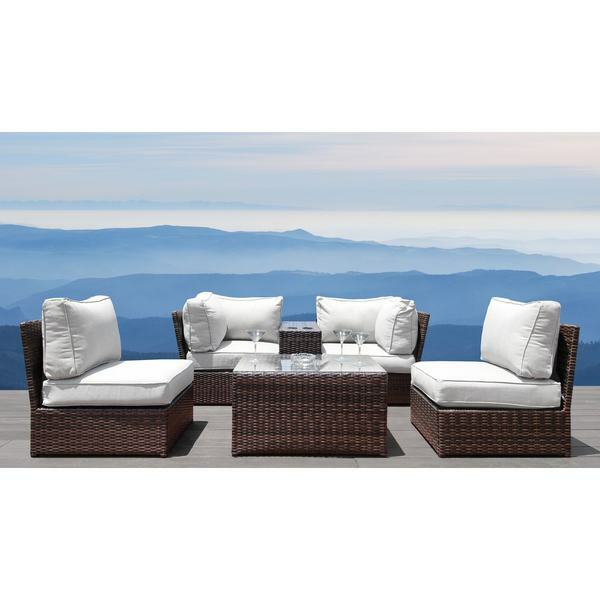 Make any outdoor living space your own personal oasis with the Lucca Collection from Living Source International. With our exclusive 5" thick Ultrasoft Cushion , this piece comprises the perfect balance of beauty and functionality. All Lucca Collection sets include our standard oversized dimensions for increased comfort. Hand crafted from durable strands of wicker incorporating a stunning assortment of different shades of brown, the Lucca collection is a must have for any backyard. "does this set include sofa, 2 chairs and table?" This includes the two corner chairs with the cup holder, which is equal to a sofa, the two armless chairs and one coffee table.